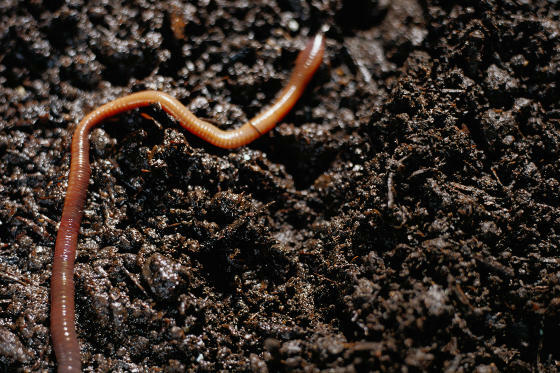 If you’ve ever wondered what is soil made of – GOOD! You absolutely need to wonder about this kind of thing if you’re going to grow optimally healthy food. Check out this video or read on below and you’ll see that many of our most important organic gardening tasks stem from this vital question. And for more information on how to improve the nutrition and biological diversity of your soil, check out my organic fertilizing guide. Phil:	Hey guys it’s Phil from smilinggardener.com. If you haven’t checked out my free online organic gardening course you can do that right on the homepage of smilinggardener.com and this is the first lesson of this new series. There is not a whole lot of plants going on behind me because it’s still early spring but that’s okay because the first lesson always has to be about soil anyway and the thing I really like to always start talking about is what is soil made of, how does it form, just a quick look at this because isn’t given the respect it deserves in a lot of circles, certainly in organic gardening we think a lot differently let’s have a look at our soil here. It’s gotta drink my tea before it gets too cold. So how does soil form. Soil forms from rock. It starts as rock and then over thousands of years you have wind coming in, you have rain coming down, you have chemical reactions that occur and you have a temperature changes, freezing and staying in hot temperatures and gradually it gets broken down, a lot of this is very physical and mechanical a little bit of chemical too but the thing it doesn’t get talked about is much is the biology, so the biology is when plants start to come in, there is just enough soil that little plants can come and little microorganisms to come in and they work together often to start to produce even better soil and soil that has a little bit of organic matter in there and so that part is really important and that’s what we talk about inorganic garden, now what I want to talk about today is I just want to get inside all our heads that we are talking about soil as a vibrant community. It’s chemical, it’s physical, it’s also very biological. So that’s what we look at, now today I kind of wanted to just look briefly at the soil texture and what that really means is the proportion of sand silt and clay in your soil because mostly that’s what the soil is, the rock it’s broken into sand which is pretty big, silt which is smaller and clay which is really, really tiny, so what you do is you try to get a little bit of soil maybe like a third of a cup into your hand, take out the organic debris, try to squeeze it into a bowl and then roll it down to cylinder and the more you can do that, the more silt and clay you have. If it doesn’t hardly squeeze into anything you have a really sandy soil. My mike just fell off, check, check, check okay we are still going so, the texture influences the structure and what the structure is it’s how the soil kind of crumbles how it stays together are rally sandy soil texture, doesn’t stay together very well, kind of falls apart. It allows a lot of air in there but doesn’t hold water very well. So that influences how you water, a heavy clay soil hold plenty of water which is great but doesn’t hold that much area so you have to think about that also influences how you water. Both of them influence how you fertilize or what we are gonna be talking about a lot of fertilizer, the cruel thing is even if you have a very sandy soil or a very high clay soil, there is something that can moderate that and that is organic matter, so here we have leaves that make the best melt ever, we have stray that makes a pretty good melt too. In here I have composed but I put in last year and all of these things are gonna serve to really moderate to extreme. So if I get organic matter in there get humus building in the soil. If I have a sandy soil which I don’t have here, it’s gonna help that soil to hold a lot more water and hold a lot more nutrition because sand is not whole nutrients very well at all. If I have a clay soil getting that organic matter in there is gonna allow to get more air because the roots need air in the soil food bed needs air. It’s gonna allow it to resist compaction too and you know there is so many other things that organic matter does, resisting erosion providing nutrients all kinds of cool stuff. So really we are gonna be talking about organic matter a lot during this course, so that is just a little introduction to soil. All I really want to get across when I am talking about soil early on is just important it is for the garden and how we can learn a lot about our soil by digging in it, we are gonna be focusing on increasing organic matter, increasing minerals and proving the soil food web, it’s gonna be physics and chemistry and biology and all of this is so important to have healthy flowers, healthy trees and especially for nutrient dense food which is what I have really invested in and I have done to a little more detail in the article if you want to read that, that’s all, that’s all. If you are watching this on YouTube subscribe because there is a lot more videos in this series coming up. If you are watching on my website, you can sign up for my email list and I am going to send this as we go, I will see you next time. The usual story is that soil is basically a rather lifeless, static place for plant roots to sit and collect water and a few nutrients. This would work okay if soil were a Magic grow toy, but it takes a lot more than N-P-K (nitrogen, phosphorus and potassium) to support the vibrant, living community that actually makes up healthy soil. To understand what soil is made of, let’s start by answering the question how does soil form? It all starts with the bedrock, or parent material. This gets broken down first by wind, water, temperature changes and chemical reactions. This happens over thousands of years to create the beginnings of soil, but it’s still lifeless. Then come the living organisms, the microorganisms and plants that work together to gradually turn lifeless dirt into a thriving ecosystem. These organisms are the ticket! They’re a vital part of good organic soil, so I focus just as much on them as I do on nutrients in my teaching. You’ll learn a lot more about them in the lessons to come, since one of your main goals is ensuring you have enough of them and then making them happy. So that’s the basics on the ‘how does soil form’ question – it’s created by environmental forces and by plants and other organisms. Now back to the first question – what is soil made of? To get a picture of what makes up the basic mineral soil that our organisms are working with – the setting for our soil community – we need to understand soil texture. There are three basic soil particle sizes: sand is the biggest, followed by silt (which is like sand but a lot smaller) and finally clay particles, which are WAY smaller and quite different from the first two. Your soil texture refers to the relative amounts of these particles. If you have mostly sand, you may have a sandy garden soil. If you have mostly silt or clay, you may have a silty garden soil or a clay garden soil. Ultimately, most soils are somewhere in the middle with names such as sandy loam or silty clay loam. The quickest way to get a feel for your soil texture is to shape some moist soil into a ball, then try to roll that out into a cylinder. If it feels gritty and has a hard time holding a ball shape, you have a lot of sand. The soil texture from up above is the main factor in your soil structure. Structure means how these individual granules clump together into globs of various shapes and sizes, or “aggregates”. And then what that means for things like water and air movement, compaction, biological activity and root growth. Knowing your soil texture and structure gives an important starting place for understanding how water and air will behave in your soil, which helps you make many important organic gardening decisions. For example, a sandy soil will need watering much more often, but only a little water can be applied each time because most of it would just drain right through. It also affects which organic fertilizers and soil amendments you should use and how much of them to use, and of course which plants will be most appropriate for your soil. But if you don’t have much clay, don’t worry – it turns out that organic matter is the real life of the party. Many soil textbooks that answer the question ‘what is soil made of’ focus on the sand, silt and clay, and while these certainly are by far the most prominent part of the soil, a little bit of organic matter makes a world of difference. Not only does organic matter beat even clay when it comes to holding onto nutrients, it also gives your soil better drainage, water-holding capacity, air-holding capacity, and resistance to compaction and erosion. Increasing soil organic matter is another one of our main goals. Phil:	Hey guys this is Phil from smilinggardener.com. If you haven’t picked up my free online organic gardening course, you can do that right on my homepage of smilinggardener.com but this is today is this is actually the first of the new three series of lessons on how to grow a healthy organic garden, obviously I am not in my garden right now, I am actually in the south of Peru hanging out on the beach here. I am in Peru for another month or so and once I get back in my garden maybe reshoot this video and I will certainly be shooting more videos in this series of lessons but I wanted to stay talk about soil. Always when I start a new any kind of like my smilinggardener academy which is my online gardening course or even this free series of lessons here I always started talking about soil even though it’s not the most exciting for some people because it’s definitely the most important thing for having organic garden is improving your soil. What I am talking about today in this first lesson. I am not gonna say it all in the video but is how soil forms and what soil is made of because this is really important question to ask ourselves, we can learn a lot by asking this so if we look at this soil here. If I try to roll this into a ball and then into a cylinder I can’t do it. It just falls apart and that’s because it’s sand. Obviously I am on a beach but you can do this in your soil and you can kind of figure out how much sand you have, how much clay you have, clay sticks together more and that helps you make a lot of decisions about how much water to apply, how often to water how much fertilizer you can apply, which plant you should be planting, really helps to know your soil texture is what we call that, texture sands tilting clay and then what texture we can help figure our structure which is how our soil stays together. How it aggregates, helps us answer a lot of these gardening questions. So I will talk more about it and the written part of the post I am gonna get into it today because I can’t really show you anything but that is all for now. So if you’re wondering how does soil form, like how does really good vegetable garden soil form, that usually involves some input from us if we want it to be productive year after year. In the end, the best way to turn bare dirt into nutritious soil is to provide what’s often lacking – balanced broad-spectrum nutrition, lots of varied organic matter, and a diverse group of soil microorganisms, too. That’s what the next many lessons are going to be about. Yes, as far as I can tell, Azomite is okay. Go for it. Thanks so much for another superb article! I am a new gardener with littleexperience and I believe (through reading some of your articles) I may havemade a BIG mistake. I live at the ocean and so, due to the sand, I made araised bed garden last year and filled it with some dirt (not store bought,because I thought that would be healthiest.) After a first year of gardeningand watching my pitifully small plants struggle to survive, I did some researchand began making compost. I spread the compost over the garden recently andafter hearing good reports and reading a pamphlet on some good dirt, I made apurchase. Well, that “purchase” is spread all over my garden and itappears to be mostly mulch….. Help! I have some potato plants sprouting outof it (presumably from the compost) and thriving but I can’t imagine the rootsof tomatoes or lettuce trying to grown through the mulch! There is some bettersoil underneath and thankfully, the larger particles of mulch seem to be at thesurface. . . If I could start over I would have done things a lotdifferently…… Do you have any suggestions? It’s good to have a layer of mulch on the soil surface, and if it looks kind of like soil, that probably means it’s already been partially broken down by microbes. So you may have nothing to worry about. If the mulch is very woody, you’ll probably want to supply your plants with extra nitrogen (fish or organic alfalfa pellets, for example). Thank you for these free lessons! I am starting a new garden this year and, even though we live nowhere near an ocean (Oklahoma) we have nothing but sand. I did know that sand doesn’t hold water well but how to build the soil to be healthy and happy is something I know nothing about and am looking forward to learning from you! One question, I had planned on buying organic dirt in bags and raise my beds to put it in. Can you tell me if I need to do something different. I’m so excited about getting started!Thanks again for what you are doing!! My recommendation is to buy compost instead of soil. It will be better for your sandy soil in every way. I have sand and can only grow moss!! The yard erodes so badly bc we cannot get grass to stay. When I few it a few years ago it was great then my biz grew I got busy and hired Lawn doctor to care for it. Inside of three months the grass was dying, weeds were overtaking the grass and moss. Years of trying to grow grass gone in months! I don’t know what they did to it but it has never been the same! I need to figure out how to fix it!! Get a soil test from a good organic lab (maybe ship it to Crop Services International) and they will help you balance out the nutrients in your soil. 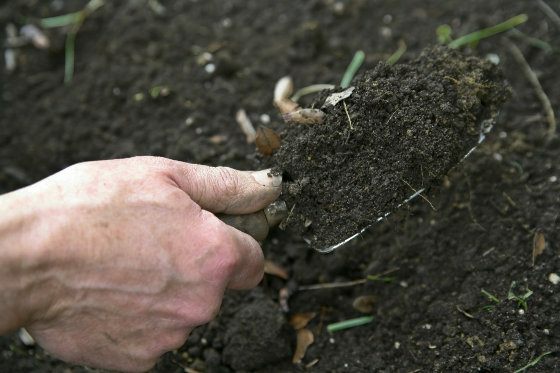 Also if your soil is low in organic matter (as indicated on the soil test, or if it doesn’t have a nice dark color when you dig a hole), find a source of high quality compost and put 1/4 inch down each year for a few years. It’s more complicated than this, but these are the 1st two things I would do. I have been reading your info on soils and I fully agree with you on building the soil with organic matter. I have a degree in horticulture from a long time ago and went into business doing something totally unrelated and now relearning a lot of stuff. I am in the process of putting in a native perennial garden.The area had been in crab grass for years. I found it full of earthworms when I began to dig up the old grass and decided to abandon digging since this would destroy their tunnels. The clay soil was amazingly loose. I rented a sod cutter to cut the crab grass from it’s roots. I used kraft paper over the are and put down a mulch-compost material bought bulk from a local brush recycle company and now waiting for rain if it ever comes again here in North TX to start planting. Once the plants are big enough I will add additional mulch to protect the moisture that is existing. I do not plan on watering once established. i seen this done at a similar city test garden which was not watered for the past 3 years including our 2011, one of the driest and hottest on recorded. So keep putting the word out on how important mulch is for protecting and feeding the microorganisms. Thanks for your comments. Hope the kraft paper and mulch keeps the crab grass away for you. The thought of “opening a pottery studio with all the clay [we]’ve got” really doesn’t appeal so looking forward to your suggestions. We’ve just bought a house [UK] with a garden that hasn’t been tended well for a good few years (lots of moss patches, waterlogged patches, bumps and troughs) and intend spending this year just trying to improve the soil and gracefully levelling (can’t afford to returf) while we work out what plants we’ve got to work with already in the garden and improve the lawn before getting more creative next year… Appreciating all and any advice! Help. My soil in my veg garden has a green slimy surface which, I suppose, means it is too acidic. What should I do? Send a soil sample to a good organic lab (such as Crop Services International) and they will help you balance out the acidity with the appropriate nutrients. A pH test alone doesn’t help – you need a full soil test. I have about 10 gallons of worm castings left over from last fall. How should I incorporate these into my soil this year ? And do I need to use a fertilizer with it ? I would spread the casting out evenly over the whole garden and perhaps lightly work them into the top inch of soil. Even a very thin application is very helpful for the soil. Or if your garden is too big, you can just use them in the most important areas.Fertilizer is a different story. Broad spectrum fertilizers like kelp and sea minerals offer benefits that the castings don’t, and of course the casting offer benefits that the fertilizers don’t, so they’re both useful to use. As for specific soil fertilizers like lime, those are often needed too, but we usually apply them only when we’ve sent a soil sample to a good soil lab and found out what our soil is deficient in – that’s how we know what to apply when it comes to big doses of specific nutrients. Phil,How do you feel about using liquid Corn gluten to keep weed seeds from germinating? If you have the species of weeds that corn gluten works with, I like it. The only downside is that most corn gluten is from genetically modified corn, and I don’t use that in my garden, but if you can get your hands on a non-gmo product, I’m all for it. Has a nice bit of nitrogen, too. Have you heard of using psyllium husks to hold water in the soil? I can get it cheaply at a local bulk food merchant. I haven’t heard of that. It seems to me if you’re buying it from a bulk food place that it would still be very expensive for a gardening application, but if you can really get it very affordably, I think it would be worth a try if your soil is sandy. Hey Phil! We are in Piedmont NC and have horrible clay soil. It’s so bad–we are mending by hand tilling it with conditioner and mushroom compost, but still having pots in addition to the soil because we are afraid it won’t grow vegetables very well (raised beds next season for sure). Is there a specific brand of gardening soil you recommend we use for the pots? We are going to mix it with mushroom compost and possibly conditioner if we need to as well, but we are really wanting to have potted veggies so we can have promise that something will grow. Do you have any suggestions different than how we are going to create this soil than what I said? Thanks for your help! Hi Kurri, I don’t recommend any particular brand of potting mix. Try to find something organic. You might also want to try making your own with 1/3 topsoil, 1/3 coarse sand and 1/3 compost. Make sure the compost (mushroom or other) is organic (conventional mushroom compost will probably have some pesticides).For improving your clay soil, a small amount of compost can help, but it can also hurt if you add too much. Equally important is to send a soil sample to a good, organic lab and follow their fertilizing recommendations for balancing the soil fertility. Compaction is a chemistry problem more so than a physics problem, which is why the fertility matters. It’s also a biology problem, so you’ll want to do things to encourage a healthy soil food web (good compost, microbial inoculants, etc.). Mulching will help too.